If you've thought and discussed why your employer doesn't have company crèche, this week's article looks at the pros and cons of onsite child care. 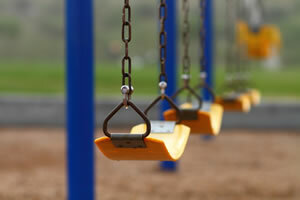 We also look at the phenomenon of our disappearing playgrounds in our article New Playgrounds are Boring. Are we removing the fun and challenge from our parks and creating a nation of risk-averse, cotton-wrapped children? Are they a viable child care option? With child care shortages for the under twos high and with many companies actively looking for ways to keep hold of their talented female staff and avoid costly recruitment and training of new staff, not to mention to be seen to be providing a family friendly workplace, the question many parents ask is "Why can't we just have an office-based crèche?" It would seem the obvious solution. Many large companies have a small army of parents with pre-school aged children and at least one or two large rooms (or entire floors in many cases) that are largely unused. Office based crèches provide a safe environment for children. They also eliminate the need for separate drop offs and pick ups, which often add considerable time, petrol costs and stress to already financially and emotionally stretched parents. Are we removing the fun from our parks? Over the last few years, there has been a strange phenomenon sweeping Australia, similar to the eighties phenomenon of Crop Circles and a bit like that spooky new US TV series, The Leftovers. In leafy suburbs everywhere parents and kids have been left wondering where their playground equipment disappeared to overnight. Interesting, fun and challenging equipment, such as witches' hats, rockets, roundabouts and monkey bars have been there one minute and gone the next. With no notice or fanfare. Occasionally a sign might be left saying they've "gone off to be repaired", never to return… sort of like the animals that "go to the farm" when they're old. All that's left to keep the kids amused in our suburban playgrounds are sand pits, low-level ropewalks, a tiny wooden house or pretend pirate ship and a few swings. What is going on? Sadly, safety standards and fear of litigation are ruining our kids' playgrounds and making them into overly safety-conscious, fun-free zones that may just about be challenging to toddlers, but not to any child over the age of three.